Freeman told FasterSkier that blood sugar issues weren’t a problem, but that he simply didn’t have a great race on Saturday. 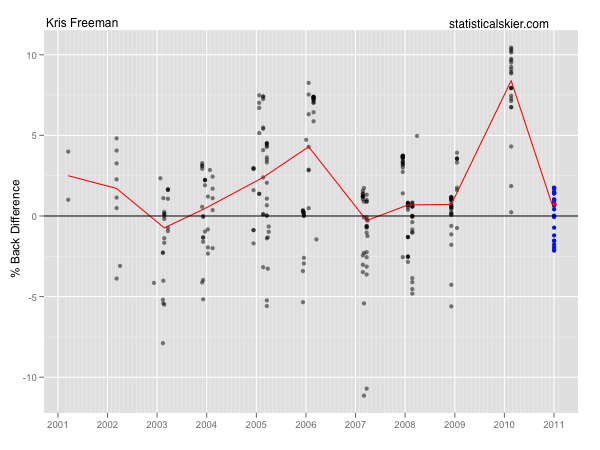 Well, it’s quite clear from this percent-back difference plot what happens when he does have blood sugar problems, as he did last season (this graph only includes mass start and pursuit races, which is why there’s only that one bad Olympic race for Freeman last season). But if you move back earlier in his career, I don’t think this race looks all that bad in comparison. Of course, it may be bad from the perspective of how fit he is right now, but compared to how he’s fared in these sorts of races in the past, I’d actually call that one fairly solid. And of course, he’s always been a bit more of a threat in the 15k events. Now, Kershaw was 13th in this race and his FIS points were only slightly better than what’s typical for him, so I don’t think the FIS points are too misleading in this case. 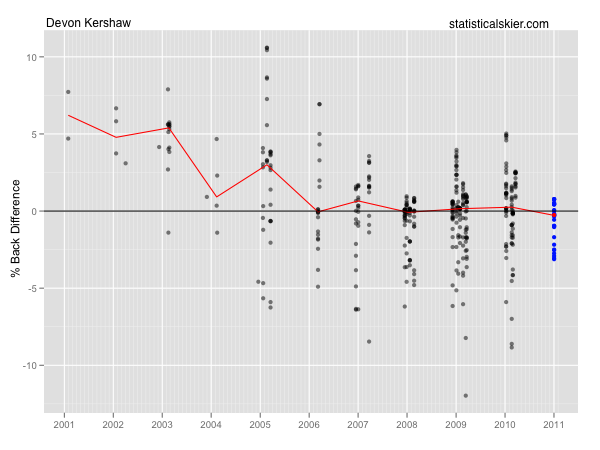 In mass start or pursuit races, Kershaw has basically been right in the middle of this particular group of 30-40 skiers (his median has been hugging that 0 line pretty closely). I’d call that about what we’d expect from him in this type of race, on average. 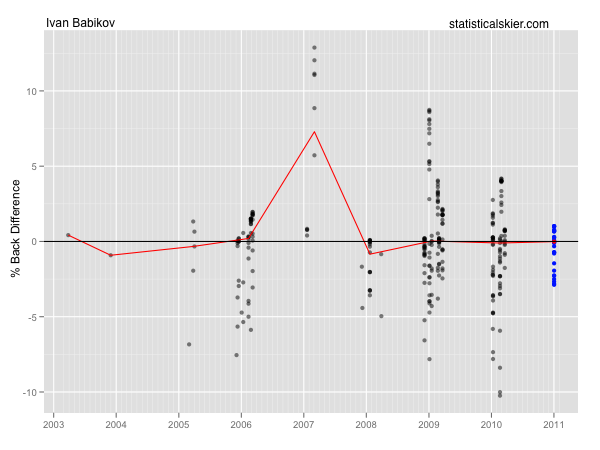 And again, I’d say that his 16th place on Saturday was a good sign in the sense that that’s just about what we expect from Babikov, on average. Although if he’s going to pop a good race, it’ll be in a freestyle event to be sure. 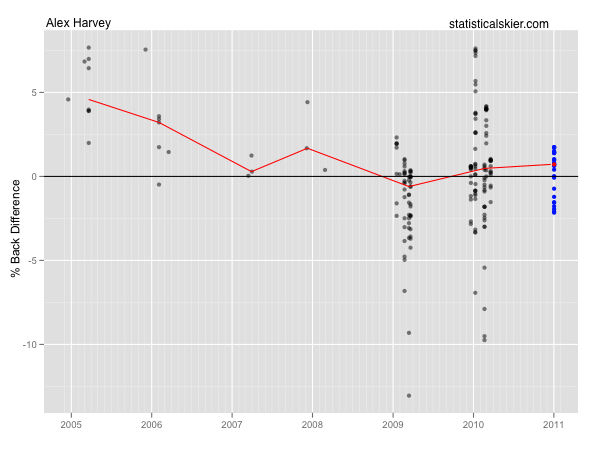 His raw FIS points suggested a slightly above average race, and this suggests something closer to average, or a bit below. In general, this is basically what I’d expect from these four guys: consistently between 10th-25th, but they’ll really have to put everything together to push up above that. Posted by Joran on Tuesday, December 21, 2010, at 6:00 am. Filed under Uncategorized. Tagged Distance, freestyle, la clusaz, mass start, men, recap, World Cup. Follow any responses to this post with its comments RSS feed. You can post a comment or trackback from your blog.